The next meeting of the Society takes place on Thursday 10th March 2016 at 7:30 pm in St. Andrew’s Church, Bilston Street, Sedgley. The speaker is Keith Hodgkins, vice-chairman of Tipton Civic Society and passionate Black Country heritage campaigner. Keith’s archive photographs of West Bromwich show the town from the 1900s to the 1970s. West Bromwich (recorded in the Domesday Book as Bromwic) became a Country Borough in 1882. By 1939 it covered 7,180 acres and had a population of 83,150. In 1966 the borough was extended to include most of Tipton and Wednesbury as well as parts of other districts. Finally, in April 1974, it became a major part of the new Metropolitan Borough of Sandwell. The evening is an ideal opportunity to view the changing fortunes of a town once the home of Braithwaites, bridge builders and Kenrick & Jefferson, stationery manufacturers. Now West Bromwich is best known for its football team and radical redevelopment of the shopping centre. We asked if you could find the sculpture and tell us what it represented. 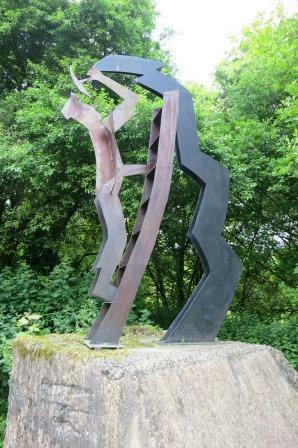 The sculpture, in Baggeridge Country Park, represents a miner cutting coal with an axe. A second miner, not shown, is using a rock drill. They are mounted on concrete blocks from the foundations of ventilation equipment used by Baggeridge pit. The Miners were unveiled in March 1998 to commemorate the 30th anniversary of the closure of the Gospel End mine. The very name ‘Gornal’ when prefixed with ‘Upper’ or ‘Lower’ conjures up two Black Country villages worth a visit. The ridgeway village of Upper Gornal was written down as Over Gornal at least 400 years ago. 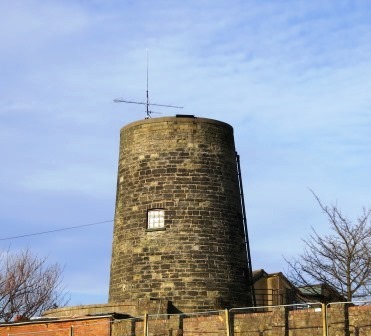 Its most well-known hamlet is Ruiton dominated by a windmill and chapel. Lower Gornal, one time Nether Gornal, lies to the west of the ridge. The lowest part is known as Gornal Wood. As the land falls away a labyrinth of streets can be explored. In November 2014 Ned Williams, the well-respected Black Country historian, launched a book The Gornals. Packed with photographs and stories it was a worthy record of the villages. The book’s overwhelming success led him to publish a sequel, The Gornals – Volume 2 in November 2015. If you are unable to find copies, visit Ned’s website. A winter or spring walk is recommended. Search out chapels, churches, pubs, cottages and walls built in Gornal sandstone. Also take in stunning views to the west. Shakespeare certainly summed up winter. 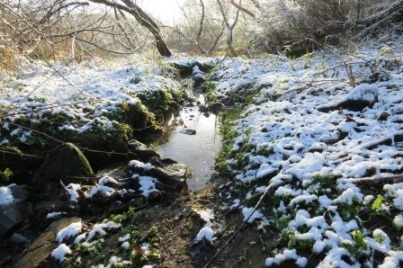 The picture, taken in January 2015, shows the brook of Swanbrook Valley, Woodsetton. Wintery conditions offer unexpected views throughout Sedgley Manor and the chance to take memorable pictures.